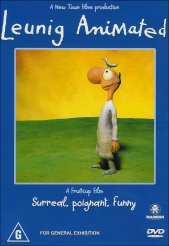 Produced by Bryan Brown and voiced by Sam Neill, Leunig Animated brings to life the work of respected satirist Michael Leunig. His work, though well known may escape some readers. To refresh you however, he did the advertisements on television for Reach toothbrushes. The series aired on SBS a few years ago however the enjoyment I got from it at that time was nothing compared to watching the disc in it's entirety with each segment complimenting the next. Whilst it was not necessary to watch them in any particular order and in a fact one of the special features is to play them in random order. With so many pieces of work on hand to view, it's possible to have something for everyone on this disc. There were a number of times that I didn't fully understand why the skit was included, however acknowledge that it's the nature of art that we don't always understand or appreciate it. The humour and points that Leunig make often point to the surreal and there is a touch of sadness behind every skit even the funny ones. Many of the animations follow the original art to the letter and are truly a wonderful addition or continuation to Leunig's craft. The score for each segment is wonderfully composed and would be nice to hear longer and fuller versions of much of the music. The extras on the disc flesh out the contents further still, making the Leunig DVD a very well thought out piece of contemporary art in it's own right.